The Department for Education has criticised today's [18 Mar] announcement by teaching unions in England and Wales that they are to stage a series of strikes next term. In a joint statement, the two largest teaching unions, the National Union of Teachers (NUT) and National Association of Schoolmasters Union of Women's Teachers (NASUWT), announced that a series of localised strikes would begin on 27 June in the north-west of England. A Department for Education spokesman said they were "very disappointed" with the NUT and NASUWT decision to take strike action. "Industrial action will disrupt pupils' education, hugely inconvenience parents and damage the profession's reputation in the eyes of the public at a time when our reforms are driving up standards across the country," the spokesman said. "We think giving schools the freedom to reward good performance is much fairer than current arrangements which see the vast majority of teachers automatically getting a pay rise each year. We have met frequently with the NUT and NASUWT to discuss their concerns and will continue to do so." In a speech at the Conservative party annual conference in October, Michael Gove attacked the industrial action, accusing union leaders of "letting their ideology hold back our children". The statement said that unless the government responded positively to their demands "a rolling programme of strike action will continue into the autumn term and will include a one day all-out national strike before the end of the autumn term". NASUWT general secretary Chris Keates added: "The time has come for the secretary of state to listen to the concerns of teachers and school leaders. He has recklessly pursued a relentless attack on the profession and teachers' patience has been exhausted. The secretary of state still has time to avoid widespread disruption in schools by responding positively and quickly to the reasonable demands we are making." The NASUWT said 40% of its membership voted in the industrial action ballot, of whom 82% voted to strike and 91% to take action short of a strike. Among NUT members, the turnout was 27%, of whom 82.5% voted for strikes. 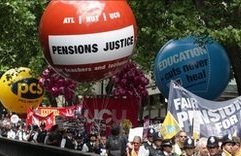 Dr Mary Bousted, leader of the Association of Teachers and Lecturers (ATL) said that despite sharing concerns about planned changes to pay and pensions members had not expressed a desire to take strike action, "at present we don't have any evidence that that is what they require".